This is not the shot I was seeking. I was at the Lembeh Resort‘s house reef on a Mandarinfish dive. The mandarinfish do their thing every day at the same time, predictable as sunset (literally). This is the most tame and predictable dive available at the Lembeh Resort. We dropped in and quickly found the patch of reef where the mandarinfish would be easiest to spot, then everybody settled in to wait. The mandarinfish rise gradually, taking … well, a very long time. Minutes, leading to tens of minutes. Maybe even a half hour. It’s not a varied and active dive. I was spread out above the reef. Neutral buoyancy, pivoting on my outspread fins. Camera ready. Eventually, I began to see the mandarinfish drifting up through the debris below me. They were everywhere, but they were down in the reef and not ready yet to partner up for their nightly show. Did I mention it was boring? Trying to stay motionless above (but not actually on) a reef. There was not a lot of activity here. I noticed that something was bumping my knee. No damage being done, but something was definitely whacking the wetsuit around my shins. I looked down and saw a tan-brown anemone with two skunk anemonefish (also called clownfish). I wasn’t touching the anemone or the fish, but I was close and had been there a while (at least whole minutes). 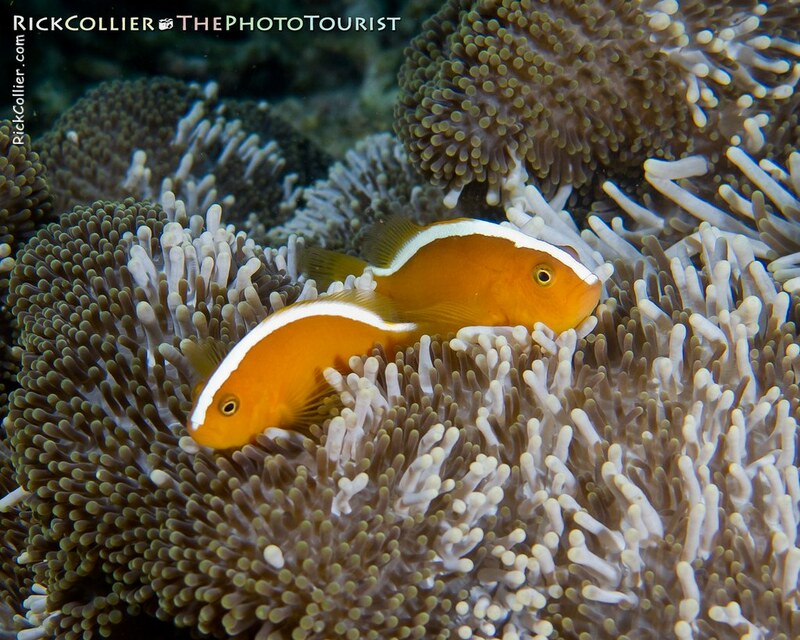 The anemonefish were protective of their anemone and wanted me gone. They took turns darting out of their anemone home to strike at the overhanging knee. With a deep breath I floated up, moved over, and settled back on the reef to wait some more. I think I have mentioned before that I just love anemonefish. These orange skunk anemonefish were the brightest, cleanest color I’d seen. The brown anemone was closing up for the night (or maybe just protecting itself from the previously mentioned knee), bringing the short tentacles in close to make a great, compact photo setting. Its color really offset and complimented the color of the fish. I leaned slightly to the left and snapped a couple shots. I still love these little fish. Eventually, the mandarinfish show did happen a few minutes later; no harm done from the premature flashes as I shot the anemonefish. This entry was posted on Wednesday, May 11th, 2011 at 22:35 PM. It is filed under thePhotoTourist, Underwater and tagged with anemone, anemone fish, anemonefish, fish, Indonesia, Lembeh, Lembeh Resort, Lembeh Strait, North Sulawesi, orange, reef, skunk, skunk anemone fish, skunk anemonefish, Sulawesi, Underwater. You can follow any responses to this entry through the RSS 2.0 feed.